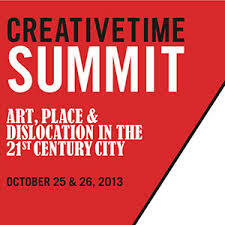 Reporting back from the Creative Time Summit of 2013. Conferences such as these are always inspiring, especially for such a small and dedicated group of people that are all over the world. The chosen theme for the year was Art and Dislocation in the 21st Century. Artists from all over the world discussed projects relating to this theme, which was both moving and informative. One of my favorite parts of the conference this year was the satellite room, where attendees could use as place to meet up and network. There were also a variety of conversations held that individuals could propose a topic at a specific time and date to discuss. I jumped at this opportunity to discuss mobility in art practices, as it relates to both my personal art practice and my role at Side Street Projects. I was able to lead a 30 minute discussion about the advantages of using mobility. The resulting conversation revealed that more artists are moving in this direction due to their capital restrictions and the accessibility element. Another highlight of the event was the award for Lucy Lippard. Her speeches are always so moving and inspiring. Next year the conference will be held in Norway, so I’ll have to use this inspiration over the next two years as I move forward with my practice.